A video has surfaced of a local federal candidate comparing abortion to the Holocaust and 9-11. Dr. Gordon Giesbrecht is the Conservative candidate for Winnipeg South. It was posted on the Horizon College and Seminary blog in March 2009. In it, Giesbrecht calls on churches to do more about abortion. His opponents in Winnipeg South criticized the post. “I think my first reaction was one of shock, because it’s frightening to see that such a comment is made in this day and age in regards to women’s rights,” said NDP candidate Brianne Goertzen. Goertzen said her party supports a women’s right to choose, and urged Giesbrecht to take responsibility for his comments. Liberal candidate Terry Duguid said the Liberal Party’s position on abortion is clear. Duguid said the Liberals will protect a women’s right to choose, and called Giesbrecht’s comments unfortunate. “Well references to 9-11 and the Holocaust are most unfortunate and really not worthy of any further comment,” said Duguid. Green Party candidate Adam Smith questioned Giesbrecht’s arguments about abortion. In a statement, Smith said “Although I don't begrudge Dr. Geisbrecht his religious convictions, if he doesn't understand why comparing abortion rights to 9-11 and the Holocaust is a hyperbolic and intentionally facile argument then I must seriously question his judgment." Giesbrecht was not available for an interview, but did release a short statement. The Winnipeg South riding has no incumbent in this election. Outgoing Conservative Member of Parliament Rod Bruinooge announced early this year that he would not be running. Bruinooge held the Winnipeg South seat for seven years. 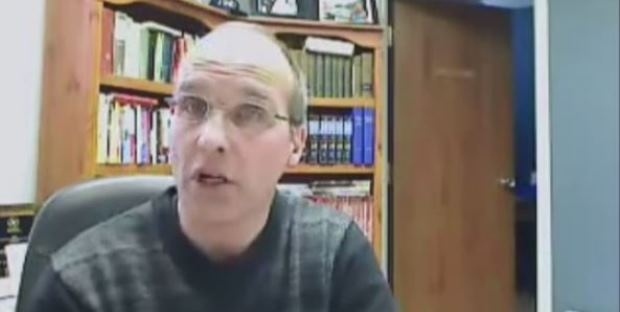 The video was posted on the Horizon College and Seminary blog in March 2009.